Why does Christine Leigh take drugs? I’ve been thinking a lot recently about Christine Leigh. Who she is? What she wants? Why she takes drugs? Christine’s relationship with Adam is the cornerstone of Carrion. She is the reason he goes up against Reiner. Without her Adam would remain inactive, Reiner’s actions would go unchallenged and our view of prohibition would remain inviolate. The story only gets under way when Adam’s desire to save Christine kicks in. But there is a problem with characterising Christine as something that needs to be saved. Certainly it allows Adam to justify arresting her at the beginning of the story but in story terms it has the potential to make her incredibly passive. There is another thing. “Characterising Christine as something that needs to be saved” underestimates or more accurately misrepresents her drug use. Overall it presupposes she is victimised by drugs. Certainly she is persecuted by prohibition. But when I think of her drug use I don’t see her as a victim. The understanding of drug user as victim relies heavily on the popular perception of those who take drugs as damaged individual running away from something. While there are undoubtably a percentage of individuals who fit this profile. I know the vast majority of people who use drugs take them for entirely different reason. If the truth were told there are probably as many reasons for using drugs as there are people who take them. There is also another misconception at play here. One that presumes everyone who takes drugs is an addict. I view this as prohibitionist propaganda. The truth is less hysterical. Just as not everyone who drinks is an alcoholic. Not everyone who takes drugs is an addict. Which brings me back to the question; why does Christine take drugs? The short answer; she is looking for something. If I had to pin it down I’d say she is actually seeking a state of grace. But I don’t think of Christine as a religious person. I think what she seeks is less devine grace and more secular enlightenment. In an earlier post I outlined something of Christine’s character. I view Christine’s drug use as her way of connecting to others. It’s not just that she has a small group of friends who are united by a common activity or the feelings of empathy that comes with the use of a drug like ecstasy. I think she uses drugs because she has a deep-rooted need to short circuit the barriers between people. At the core of that need is the barriers she feels between herself and Adam. The flip-side of this need to connect is her great weakness, rebelliousness; that impulse to resist authority, control or convention. All of which raises a question for my next post. What does her desire line look like? I set up a YouTube channel a while ago with the intention of shooting and uploading some interviews. I haven’t done that yet. What I did today was uploaded Bert Jansch – Dreamweaver. I put it up purely for promotional purposes. I long since gave up hope of getting anything but the credit from this project. I think it’s enough now just to have something that adds to my online tattoo. Dreamweaver was made with no money. Shot on borrowed cameras and took more than a year to make. Late in the production we managed to get a meeting with the head of 4Music. On the back of that meeting we were given a slot on Channel 4 and enough money to pay the cost of post-production. Dreamweaver aired 28 June 2000. It’s definitely one for the fans. There are full performances from Bert. No talking heads getting in the way of his playing. Not my choice. Personally I think that was a mistake. I think it detracts from what could have been a more fluid telling of his story but that was the agreement the producer made with Bert and those were the parameters I had to work within. 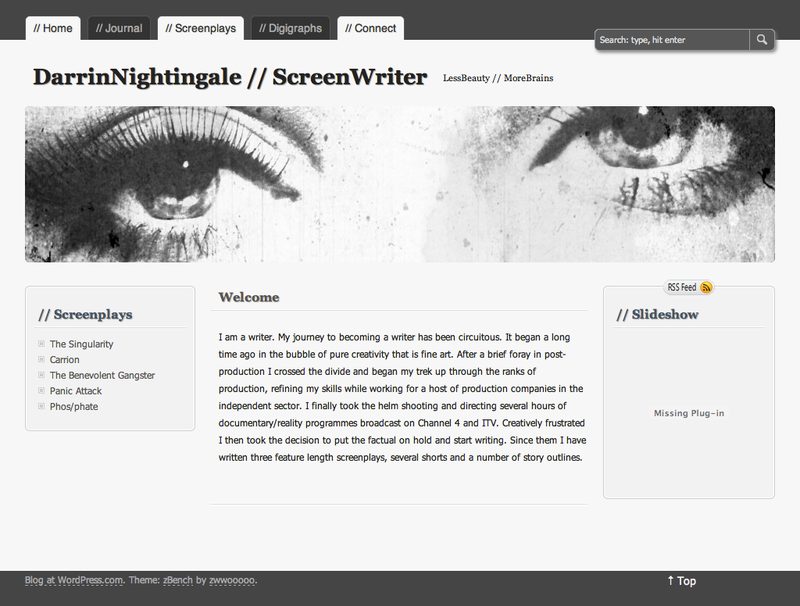 For a couple of weeks now I’ve been trawling the themes section of the Worpress.com dashboard. I was bored with the way LessBeauty // MoreBrains looked and wanted something new for the site. 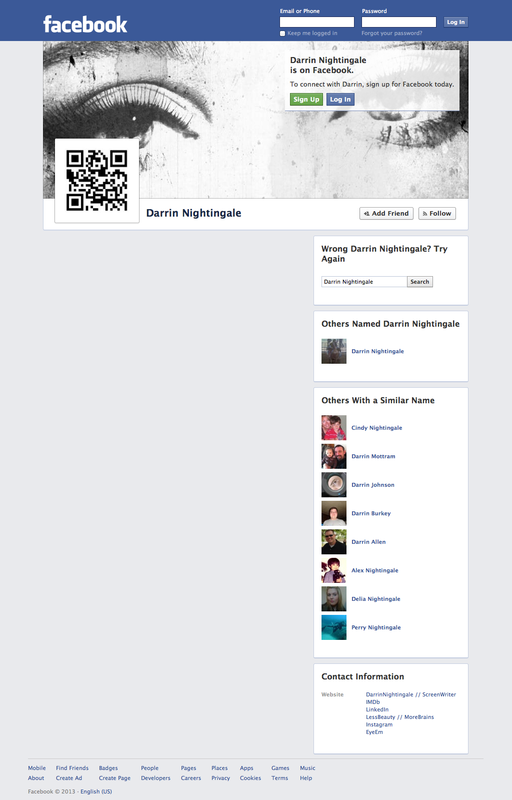 I also felt I needed to establish better links between LessBeauty // MoreBrains and DarrinNighitngale // ScreenWriter. I was giving serious consideration to importing all the content from // MoreBrains into // ScreenWriter but didn’t really want to fill // ScreenWriter up with digigraphs. Hopefully what I’ve managed to do with the new layout is give each activity its own section while making them both look like they’re part of something bigger? I posted another Backspaces story today. Because WordPress.com does not allow me to embed it, here it is as a screen capture. I recently joined the AMPt Community. “AMPt Community’s goal is to become the premier resource for mobile photography/artistry… period.” Interesting site that I hope to get a lot from. But joining AMPt got me thinking about the various platforms I have an account with. This latest addition makes to wonder if my social media is getting out of hand. 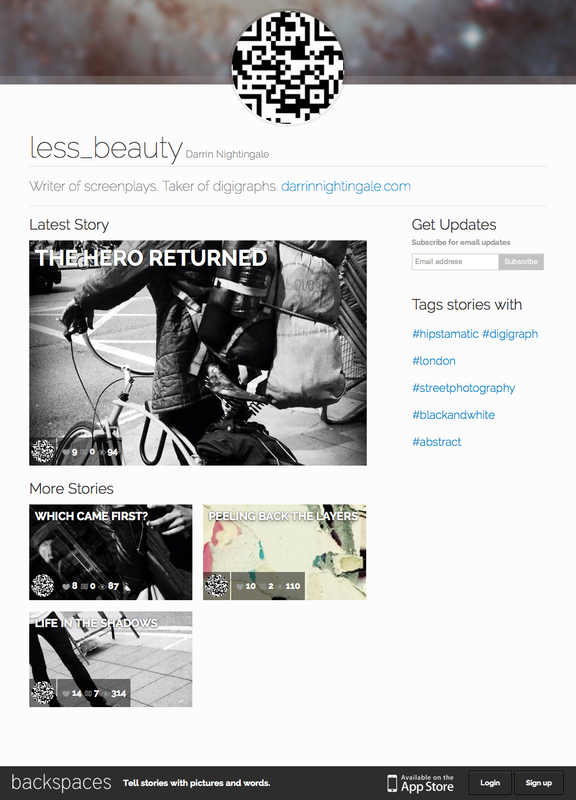 I have two main sites DarrinNightingale // ScreenWriter and it’s sister site LessBeauty // MoreBrains. Most of the posts on this site are to do with my writing. I use it as a journal. As a way of working out ideas about the various aspects of whatever story I am working on. LessBeauty // MoreBrains is home to the constant stream of digigraphs I take. These digigraphs are posted to the site from Flickr. I use Flickr because it allows me to post directly to WordPress.com from my mobile. Although the free version of Flickr only displays the most recent two hundred images it still displays all the digigraphs posted to LessBeauty // MoreBrains going back to the first post; that’s five hundred images and counting. Doing it this way I get all the images I want on my website without having to worry about busting WordPress.com storage limits. Both DarrinNightingale // ScreenWriter and LessBeauty // MoreBrains automatically feed Twitter, which in turn feeds Facebook. I never contribute directly to Facebook. I only have an account because everyone else does. More accurately it is such a broad platform that people who would not normally show up on other social networks have a Facebook account. 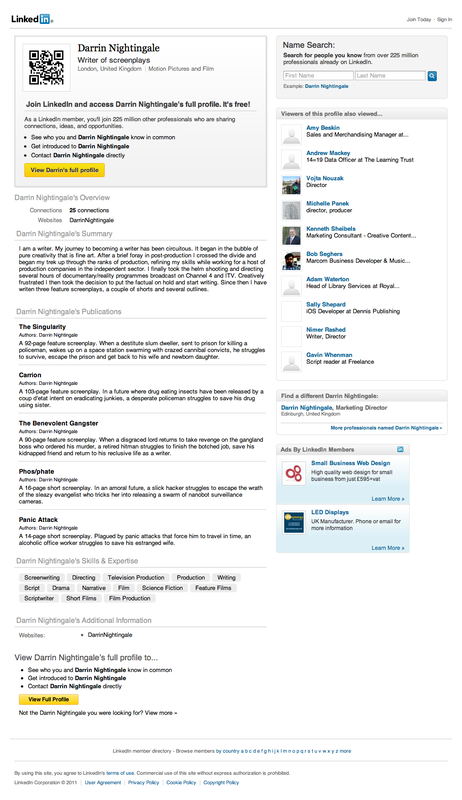 In the same way as DarrinNightingale // ScreenWriter and LessBeauty // MoreBrains feed Twitter they also feed LinkedIn. I have an account but don’t really work it as a social network. I find it a surprisingly closed. Daisy-chaining two WordPress.com sites, LinkedIn, Flickr, Twitter and Facebook means I can post to two sites while distributing across six. Easy to stay on top of. So why is my social media getting out of hand? Because as well as the above mentioned platforms I also have accounts with Instagram, EyeEm, Backspaces and now AMPt Community? A big reason for LessBeauty // MoreBrains is Instagram. Joining Instagram started the digigraph ball rolling for me. The desire to post digigraphs made me go out and take more digigraphs. I would love it if Flickr could not only feed WordPress.com but also Instagram. Not likely as Instagram explicitly prohibits this. The recent uproar over Instagram’s amended terms of service prompted me to set up an EyeEm account. Same content different place. It involves a fair amount of reposting but not unmanageable. Additionally I have also started posting stories on Backspaces. Backspaces is new platform that is, from a content point of view, a combination of images and words. This is something completely separate from Instagram and EyeEm. It forces me to think in new ways about what I’m doing. That on it’s own is worth sticking with it for the time being. On top of all that I recently joined AMPt Community. More reposting of content that already appears on Istagram and EyeEm. All in all that’s five platforms all displaying the same digigraphs. Each platform reaches a slightly different audiance but because it reverses the daisy-chaining principle I employed with my main sites it is becoming increasingly time consuming to keep up with. Not sure what I will do but I’m giving serious consideration to sliming down the portfolio of social media. What I need is a social media hub. A site that distributes my content across all the other platforms. Any ideas? A while ago references to a new app started appearing on Instagram. 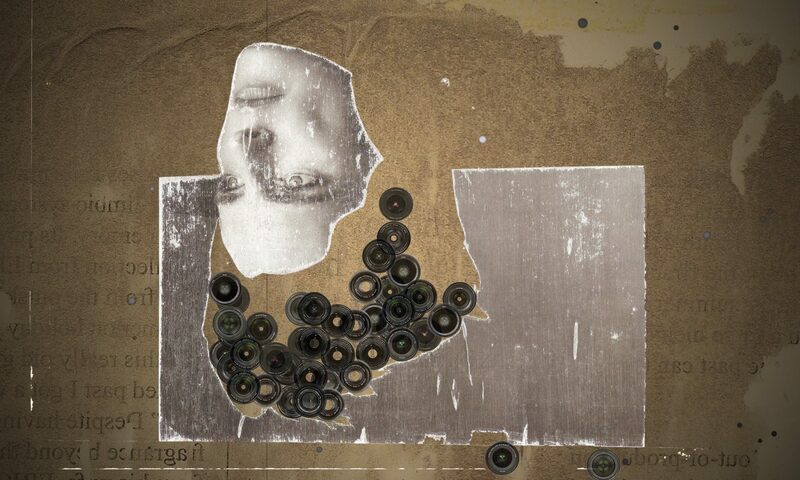 Curious I downloaded Backspaces from the App Store. It sat on my phone for weeks while I struggled to work out how to use it. Functionally it’s not complicated to use. You string together digigraphs and words to tell a story, visualise a poem, whatever you can think of. I just went round in circles over-thinking ways to put it into practice. There’s nothing unique about the sequential juxtaposition of words and images. It’s something I do all the time when writing screenplays. But for some reason I couldn’t put a Backspaces story together. In the end I just pulled some images from my camera roll and started writing. Unfortunately WordPress.com doesn’t allow me to embed these stories. So here’s the next best thing, an image capture of the stories with a link to them on Backspaces. I take a lot of digital photographs or as I like to call them digigraphs. I create them exclusively with my iPhone and the vast array of apps it supports. I distinguish these images from the direct photochemical connection to reality that is photography because I think, while they share a vast array of similarities, there is something unique about the images generated in this way. The digital image is infinitely malleable giving it a deeply subjective relationship with reality. The mobile computer/camera allows us all to capture and shape our perception of the world and distribute that vision through social networks. I would not have started creating these images if not for my iPhone. It is always with me, ubiquitous, allowing me to capture candid moments without the intrusion brought by traditional equipment. I shoot almost every day, usually walking the streets while trying to keep the sun at my back. I rarely have the camera at eye level, preferring instead to hold it low while keeping a tangental eye on the screen. I cut the earbuds off the supplied headphones to make a digital shutter release so I can capture a scene with a click of the volume button. I distribute these images across several platforms, first to my digigrah stream LessBeauty // MoreBrains then to Instagram, EyeEm and most recently AMPt Community.